Send me an email with your 10 DMC colour choices and I'll get them out to you toot sweet! Carolyn, am I the Lara of whom you speak? LOL - How Cool! 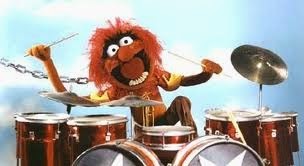 Love Animal - he is perfect for the drumroll! Well, if it is me, then you could just surprise me because I've never met a color that I don't like.